Innisfree is a South Korean cosmetics brand. 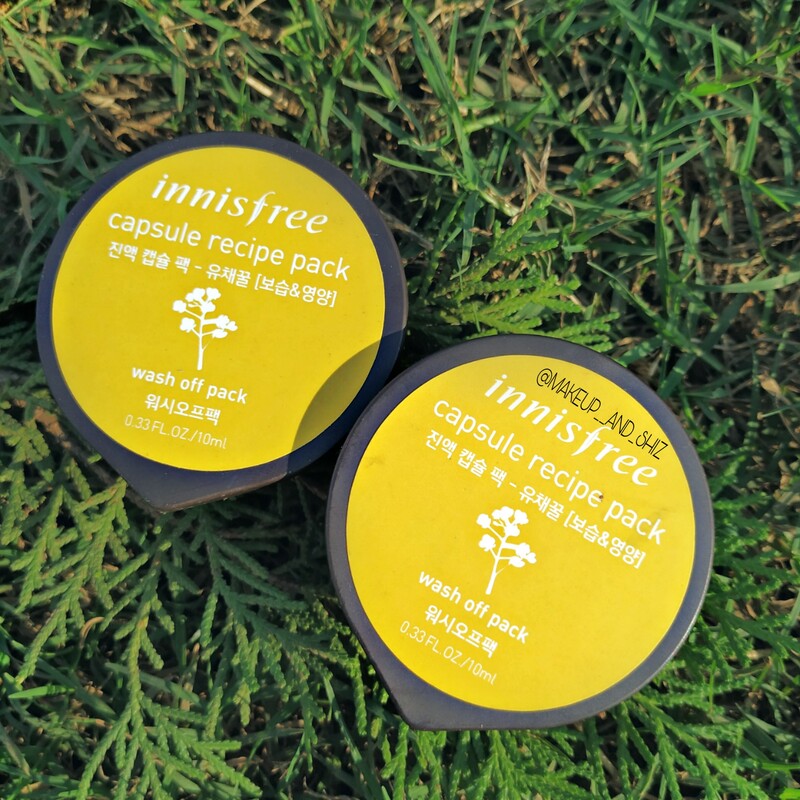 The brand says Innisfree is one of the first all natural cosmetics brand of South Korea bringing the nature’s natural benefits from Jeju Island. And today I will be reviewing one of their capsule recipe pack . Precious Canola Honey harvested from yellow canola flower gardens only in April provides the skin with nutrition, rich in flavonoids and protein, and a sweet fragrance feeling as if in the middle of a flower garden. It comes in a small plastic packs which can be covered later on . There is another layer after the lid. After every use you are supposed to put the lid back. This pack is transparent with yellow tinge and has a gel-like consistency- similar to honey. The pack looks like honey and smells like one. If you keep the pack for more than 10-15 mins it starts dripping. Canola is suppose to minimize clogged pores and reduce acne. I have dry skin and hardly ever get acne . However sometimes I do get pimples. It worked good for moisturizing my pimple spots then. I bought this mainly because it had honey and therefore thought it would work for my dry skin. But I think its better for the combination /oily/acne prone skin type. If you have combination /oily/acne prone skin type, you can give this a try. Dry and normal skin type can skip this. This was all for this post . Have you tried any of the capsule recipie pack? Comment and let me know.